Chromium is a trace mineral that is essential to health and can be naturally found in wholegrain foods, eggs and meat. This effective pill contains 200µg of the trace mineral chromium. 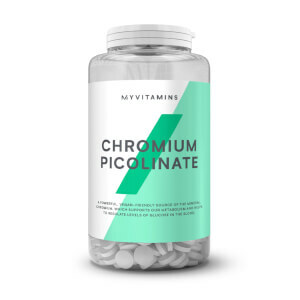 Chromium contributes to normal macronutrient metabolism and the maintenance of normal blood glucose levels making this a perfect dietary additional to help support body goals and regulate blood sugar levels, this may be beneficial for individuals with diabetes. Chromium is recommended for anyone wanting to enhance glucose metabolism, making this supplement ideal for weight management programmes, exercise and management of diabetes. To be taken as part of a varied and balanced diet and a healthy lifestyle.